Control your content by enabling/disabling the print, download and share functions. Prevent Google and other search engines from displaying your flipbook in search results by disabling search engine indexing; this way, only people with access to your flipbook’s direct link can view it. Ensure complete privacy by setting a username/password on your flipbook to protect sensitive information. In this case, no one can share or access your flipbook unless they have been given the username/password combination. 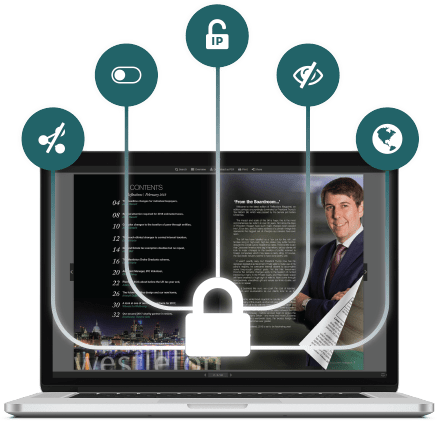 The perfect solution for businesses - with our Pro subscription you can limit access to your flipbook via IP-address; meaning that only people connected to your IP-network can view your flipbook. You can enter a combination of single IPs, wildcard ranges and set IP ranges. Read more about how to protect your flipbooks in our guide.